The exterior appearance of the Great Wolf Resort is that of an immense northern log lodge. The interior of the lobby is a spacious atrium with a spectacular stone fireplace expanding to a beautiful wood vaulted ceiling. We often found ourselves spending time in the impressive lobby with an assortment of wild animals giving us a warm and relaxing North Woods feel. The Great Wolf Resort allows you and your family to experience the great North Woods without going too far…north! Finding the Great Wolf was a cinch as it is located directly off of the Interstate. That means no driving all over the Dells and no headache navigating through traffic. Our family went to the Great Wolf during the winter months, which meant the indoor water park was our main focus. 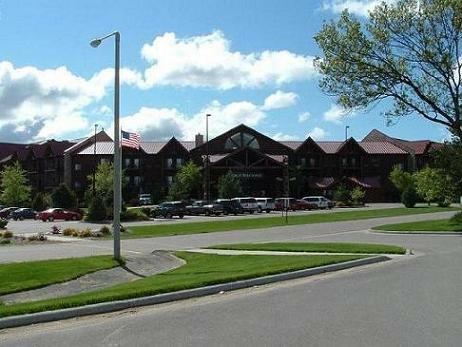 Altogether, the Great Wolf Resort has over 300 rooms, suites, and condos to choose from. Also, the resort is open year round and offers specials and promotions throughout the year. So be sure to check the website for specials before booking your room. Besides the Loose Moose, the Great Wolf Resort has four other onsite restaurants to choose from. Two cafés, Bear Claw and Camp Critter, the Wolf Den Snack Bar, and a Pizza Hut Express are there to satisfy any appetite. There are also many other food places within walking distance of the lodge, so you shouldn’t have trouble finding something to eat. The Great Wolf Resort also has daily newsletter of activities called “lodge life.” I thought it was nice feature and would be very useful for parents as most activities were geared towards children. The Great Wolf Resort Wisconsin is an award-winning location and has won polls as best family resort by Midwest Living Magazine, Family Fun, Wisconsin Trails and others.